NEW YORK — It was a different Sean Spicer who paid a visit to "Jimmy Kimmel Live" Wednesday night. 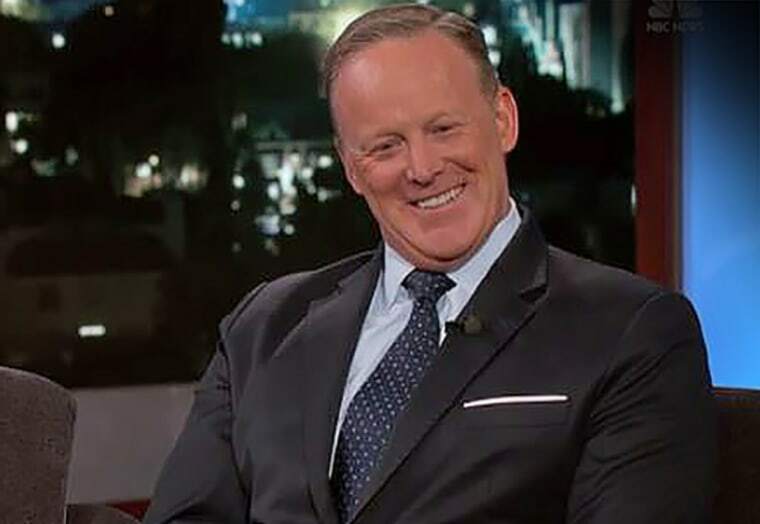 This was a smiling, chill Spicer, in marked contrast to the six hot-tempered months he spent as White House press secretary, conducting volatile news conferences that were given added heat thanks to Melissa McCarthy's unsparing impersonation of him on "Saturday Night Live." It was Spicer's first television appearance since resigning from the Trump administration in July from what Kimmel joked was his hit reality show, "I'm the Press Secretary — Get Me Out of Here." He took Kimmel's ribbing in much better spirits than the grilling the White House press corps dished out. "A lot of these members of the press were your friends, right?" Kimmel asked. "WERE, yeah," replied Spicer, chuckling. Kimmel reminded him of how his tenure began: awkwardly backing up President Donald Trump's claim that his inauguration crowd was the biggest ever, when photographic evidence proved otherwise. "Why is he so concerned with size?" asked Kimmel. "Have you ever seen the president naked?" "I have not," Spicer replied good-naturedly. But even if Spicer knew Trump's crowd wasn't larger, Kimmel pressed on, his job as press secretary obliged him to say that it was. "Your job as press secretary is to represent the president's voice," Spicer explained. "Whether you agree or not is not your job." "And then you have to march out there and go, 'He had a bigger crowd, everybody,'" Kimmel laughed. At Kimmel's urging, Spicer tried to account for the tension that prevailed between him and the press corps. "Some of us who worked very hard to get (Trump) elected felt as though a lot of folks, in the media particularly, constantly sought to undermine the validity of that election," Spicer said. "So you to have to understand it sometimes from that perspective." If Kimmel thought Spicer would dish dirt on Trump, he was disappointed. "Sean, you don't work there anymore," Kimmel jokingly egged him on. "You don't have to worry about him. We can protect you here." But Spicer remained resolute in his defense of Trump, declaring at one point, "He's a good man that really cares about this country." Even so, Spicer did acknowledge that the relationship between the press and the White House could stand some improvement. "I think there's a time when we can start taking down the temperature and get back to a more civil and constructive dialogue," he said. To that Kimmel fired back, "You mean when Mike Pence takes over?"